Cragganmore is a delicious Speyside malt from Diageo's Classic Malt collection. The stills at Cragganmore are short and flat, lacking the high swan's neck at the top of the still more commonly seen. The height of the still matters in that heavier volatiles will not clear a high still neck (as much, in theory). The distillery with the highest stills, Glenmorangie, certainly has a flavor profile dominated by the lightest volatiles: delicate, floral, and lacey. Distilleries with short stills like Macallan and Cragganmore should have a more robust mouthfeel and more of the high molecular weight volatiles like fruity esters. Cragganmore even more than Macallan with its short flat topped stills. Indeed, in the bottles of Cragganmore I have enjoyed previously I have found more fruitiness going on than the usual Speyside malt. The Distiller's edition of Cragganmore adds a port wood finish (instead of the Sherry finish used on the other Classic Malts Diatiller's editions). 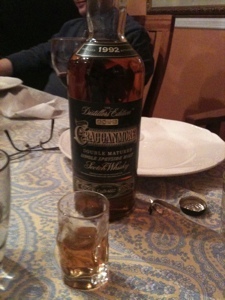 Presumably the more robust grape of port was felt to be a better mesh with Cragganmore's tropical fruit essences. Color: rich amber with copper and reddish tints. Extremely appetizing. Nose: Sandalwood perfume, passion fruit, papaya, candy with some distant echoes of old hardwoods. Entry is intensely honeyed with butterscotch, and hard candy. Mid-palate is lushly floral (honeysuckle and orchid) with a rich mouth feel. Gentle finish with melon sweetness. The finish is short, gentle and sweet. At the end there is the faintest whisper of smoke. This is sweeter than I usually like my scotch, but the whole package is so appetizing and appealing that I am completely won over. Edradour 10 is candy, wood, and spice.